Organic Mango Butter Hand Cream (Organic Mango Butter 15%) is produced by the Russian beauty brand Planeta Organica. 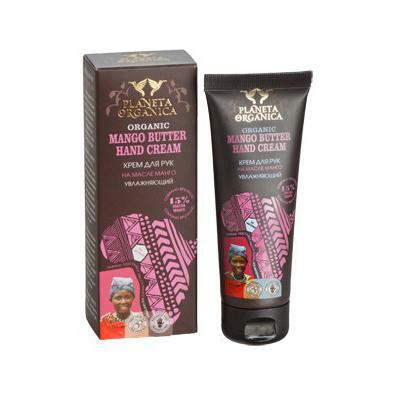 This moisturising hand cream is formulated with organic mango seed butter known for its high vitamin content. It keeps the skin of your hands hydrated and makes it soft and velvety smooth. The product is infused with tamarind extract and organic laurel oil. Ingredients: Aqua with infusions of Organic Mangifera Indica (Mango) Seed Butter, Tamarindus Indica (Tamarind) Extract, Organic Laurus Nobilis Leaf Oil, Cetearyl Alcohol, Glycerin, Sodium Stearoyl Glutamate, Xantan Gum, Citric Acid, Benzyl Alcohol, Benzoic Acid, Sorbic Acid, Parfum. Want to buy Organic Mango Butter Hand Cream? Call us or submit your order via our web site!